Located near the small town of Lee Vining, California, in the Eastern Sierra, Mono Lake is one of the oldest lakes in North America. It is one of the top tourist destinations in the state and has been a source of political battle as the tributaries flowing into Mono Lake have been diverted to Los Angeles. On September 28, 1994, California Supreme Court ordered that this diversion be limited to restore the Mono Lake's water level to maintain a healthy waterfowl habitat. This image belongs to the travel and nature stock photo library. This stock photo of Lake Mono and Tufa Formations is available for licensing for commercial and editorial uses including websites, blogs, books, magazines, brochures and advertising. Restrictions may apply for images which contain third party copyrighted material or sensitive subjects. Photos of artwork are for editorial use only. 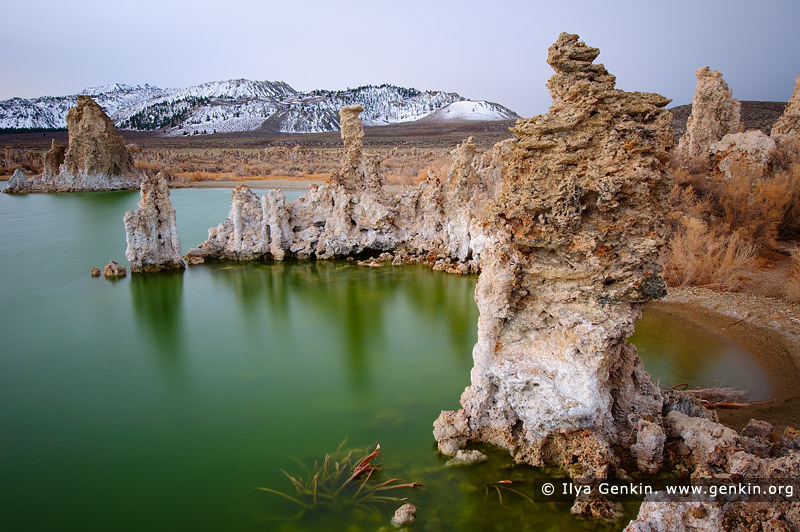 This image id USA-LAKE-MONO-0003 of Lake Mono and Tufa Formations, is copyrighted © by Ilya Genkin. This is not a public domain image.